This image from NASA's Chandra X-ray Observatory shows the center of our Galaxy, with a supermassive black hole known as Sagittarius A* (Sgr A* for short) in the center. Using intermittent observations over several years, Chandra has detected X-ray flares about once a day from Sgr A*. The flares have also been seen in infrared data from ESO's Very Large Telescope in Chile. 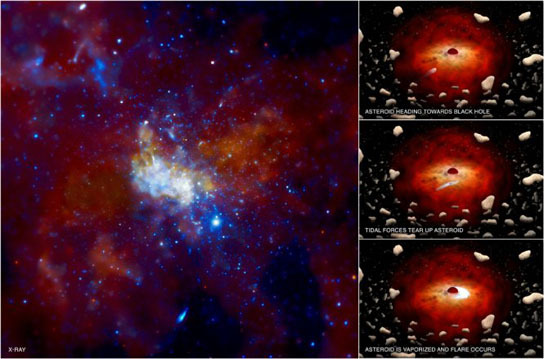 Astronomers believe that the supermassive black hole known as Sagittarius A* located at the center of the Milky Way may be destroying a large number of asteroids. Over the years, scientists at NASA’s Chandra X-ray Observatory and ESO’s Very Large Telescope in Chile have detected X-ray flares from Sgr A* and they now believe these flares are the visual effects from the asteroids being torn into pieces by the tidal forces from the black hole. The giant black hole at the center of the Milky Way may be vaporizing and devouring asteroids, which could explain the frequent flares observed, according to astronomers using data from NASA’s Chandra X-ray Observatory. For several years Chandra has detected X-ray flares about once a day from the supermassive black hole known as Sagittarius A*, or “Sgr A*” for short. The flares last a few hours with brightness ranging from a few times to nearly one hundred times that of the black hole’s regular output. The flares also have been seen in infrared data from ESO’s Very Large Telescope in Chile. Zubovas and his colleagues suggest there is a cloud around Sgr A* containing trillions of asteroids and comets, stripped from their parent stars. Asteroids passing within about 100 million miles of the black hole, roughly the distance between the Earth and the sun, would be torn into pieces by the tidal forces from the black hole. These fragments then would be vaporized by friction as they pass through the hot, thin gas flowing onto Sgr A*, similar to a meteor heating up and glowing as it falls through Earth’s atmosphere. A flare is produced and the remains of the asteroid are swallowed eventually by the black hole. These results reasonably agree with models estimating of how many asteroids are likely to be in this region, assuming that the number around stars near Earth is similar to the number surrounding stars near the center of the Milky Way. Planets thrown into orbits too close to Sgr A* also should be disrupted by tidal forces, although this would happen much less frequently than the disruption of asteroids, because planets are not as common. Such a scenario may have been responsible for a previous X-ray brightening of Sgr A* by about a factor of a million about a century ago. While this event happened many decades before X-ray telescopes existed, Chandra and other X-ray missions have seen evidence of an X-ray “light echo” reflecting off nearby clouds, providing a measure of the brightness and timing of the flare. Be the first to comment on "Scientists Believe Milky Way’s Black Hole is Vaporizing Asteroids"